The Achilles Tendon is a fibrous band of tissue that connects the two large calf muscles to the heel bone. The Achilles tendon allows the foot to extend and the toes to point. The long tendon is used during walking, running, and jumping. Injuries to the Achilles Tendon include nagging problems like tendonitis as well as major issues such as tears or ruptures. Many Achilles Tendon injuries are the result of overuse or a sudden, forceful movement typically performed in sports. One of the most common sports injuries treated at American Foot Specialists, in South Metro Atlanta, Stockbridge, Locust Grove, and Fayetteville, is an Achilles injury or rupture. Most often, it is caused by runners who change their running routines and increase their mileage or the amount of uphill running and even in changes in footwear. These factors can lead to Achilles tendonitis, a condition of irritation and inflammation of the large tendon in the back of the ankle which can cause swelling and become quite painful if not diagnosed and treated immediately. When a patient comes into our office with a foot or ankle injury, he or she usually has an x-ray taken. If the x-ray comes back negative, our doctors may utilize other modalities such as dynamic ultrasound to accurately diagnose a possible ligament rupture. With this device, our specialists are able to show patients the thickening or rupture of their ligament. This information helps inform our doctors when prescribing a specific treatment plan for each patient. At American Foot and Leg Specialists, our doctors are able to perform x-rays right in our offices without having to send the patient out for an MRI. Our patients find being able to begin treatment right away very convenient. After assessing your injury, your doctor at American Foot and Leg Specialists may suggest rest, icing the area, and anti-inflammatory painkillers. They may recommend that you wear an insert in your shoe while you recover. It will protect your Achilles tendon from further stretching. They can also suggest stretching and strengthening exercises. These techniques usually will ease the pain and the injury will heal. 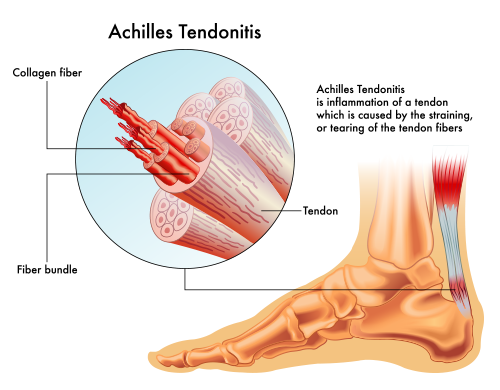 However, in some extreme cases of Achilles tendonitis, you may need a cast for 6 to 10 weeks, or even surgery to repair the tendon or remove excess tissue. You can trust the specialists at American Foot and Leg located in South Metro Atlanta, Stockbridge, Locust Grove and Fayetteville, GA, for expert advice and treatment of Achilles Tendonitis. If you are experiencing foot, heel or calf pain, call American Foot and Leg Specialists at 404-363-9944.